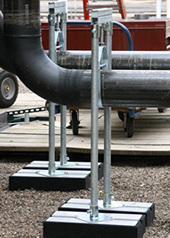 PIPE PIER® supports mechanical systems on roofs. New! XTension INF adjustable elevation kit. Use your standard 1 ¼" schedule 40 steel pipe and strut to design configurations for virtually any support challenge. Heavy duty and robust, the XTension INF may be used with the PP150, PP300 or simply anchored for a versatile support, inside or out. 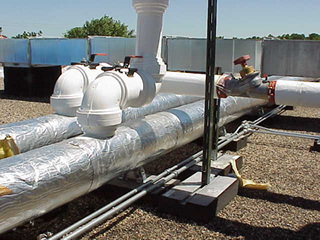 PIPE PIER® can be used for improved support for mechanical systems on commercial roofs including HVAC, plumbing and other items on the roof.